Schools Matter: I met reactionary Fernando Espuelas' challenge, now will he demand the same of Gates, Zuckerberg, and Dell? 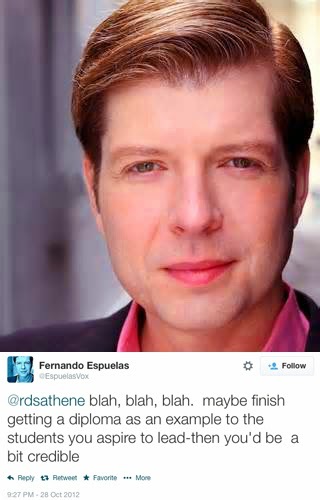 I met reactionary Fernando Espuelas' challenge, now will he demand the same of Gates, Zuckerberg, and Dell? Roughly eighteen months ago I tweeted a passage from the above quoted OIM document. The lucrative Los Angeles charter industry systematically discriminates against special needs children in favor of bloated executive salaries, as evidenced most recently by Aspire Charter Corporation's dodging of its obligation to the most vulnerable students. Not more than two minutes later I was attacked by one of Los Angeles' bullhorns for neoliberalism, reactionary Fernando Espuelas. I'll get to the exchange between Espuelas and myself momentarily, but think it's important to provide a little background on this privatization pusher. Espuelas is a venture-capitalist-turned-broadcaster who is currently a Henry Crown Fellow at the right-of-center Aspen Institute. Aspen's leadership includes genocide defender Madeleine Albright, billionaire Pete Peterson's "Fix the Debt" cheerleader Sam Nunn, NSA surveillance zealot Dianne Feinstein, neoliberal columnist Nicholas Kristof, and host of other unsavory folk who would feel comfortable at a Hoover Institution luncheon. Aspen is certainly the correct venue for Espuelas' brand of politics, who has no qualms retweeting the American Enterprise Institute (AEI), supports the apartheid regime in the Near East, and consistently called for the overthrow of the democratically elected Venezuelan President Hugo Chavez when the courageous anti-imperialist leader still lived. Espuelas served on the board of the reactionary Walton Family Foundation funded school privatization outfit "Parent Revolution" — which has close ties to both the American Legislative Exchange Council (ALEC), and the fringe-right Heartland Institute. Espuelas is best summed up by Bloomberg's Business Week which said of him: "he's all Wall Street." Despite Espuelas' offensive pleas I ran for the LAUSD School Board in 2013 against the billionaire funded corporate reform candidate, and finished second in a field of five with over 5,200 votes. 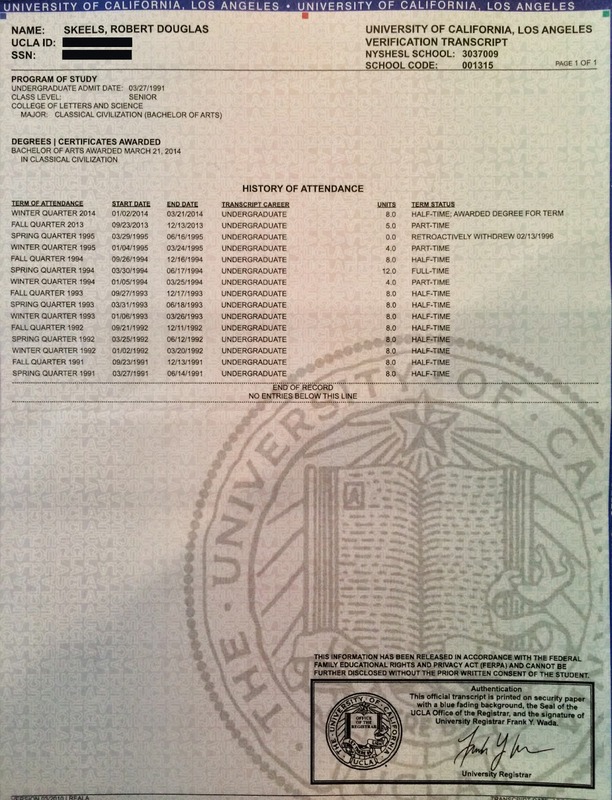 A promise to my wife to return to UCLA if I lost the race was accompanied by finally being in a position with both the time and the money to return to school. Not only did I finish my three remaining required classes, I did so with some distinction, raising my GPA by two full points. @rdsathene yes I'm a total "elitist" - I think that people that aspire to run school systems should have a university diploma - crazy! then Espuelas should make the same demand of billionaire college drop outs Bill Gates, Mark Zuckerberg, and Michael Dell. After all, all three aspire to run not only local school systems, but use their ill gotten gains to control national education policy. Gates'  noxious meddling with our remaining public education system is unprecedented, as Professor Mark D. Naison recently wrote. Perhaps if these capricious billionaires followed Espuelas's advice, just like I did, they would become educated enough to halt both their viciously destructive funding agendas, and their neoliberal policy advocacy. @EspuelasVox Getting back to your original attack. Do you agree that schools taking public funds should be obligated to educate every child. Naturally my own answer to that simple question is yes. That story deserves full treatment in the future, but would distract from our discussion here. Susan DuFresne and I had fun responding to Professor Ravitch's #ThingsInCommonWithBillGates tweet by addressing the degree issue. Ask him if a nine credit PhD bought from the Univ. of Louisville makes you a legitimate superintendent of the second largest school district in the country. Yet he still won't answer the question "Do you agree that schools taking public funds should be obligated to educate every child?"